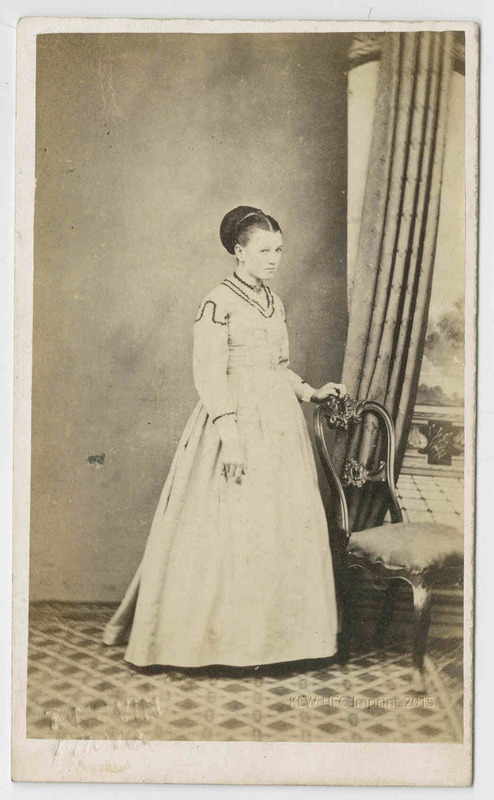 Elizabeth Rachel Day, who would become photographer Thomas J. Nevin’s fiance in 1868 and wife in 1871, was just 8 yrs old in 1855 (1847-1914) when her two uncles – master mariner Captain Edward Goldsmith, and soldier Captain Henry James Day of the 99th Regiment – prepared to leave Hobart, Tasmania for Europe. Both men were related to Elizabeth Rachel Day’s father, master mariner Captain James Day as brother-in-law (Edward Goldsmith married James Day’s sister Elizabeth Day) and first cousin (Henry James Day and James Day shared the same paternal grandparents). 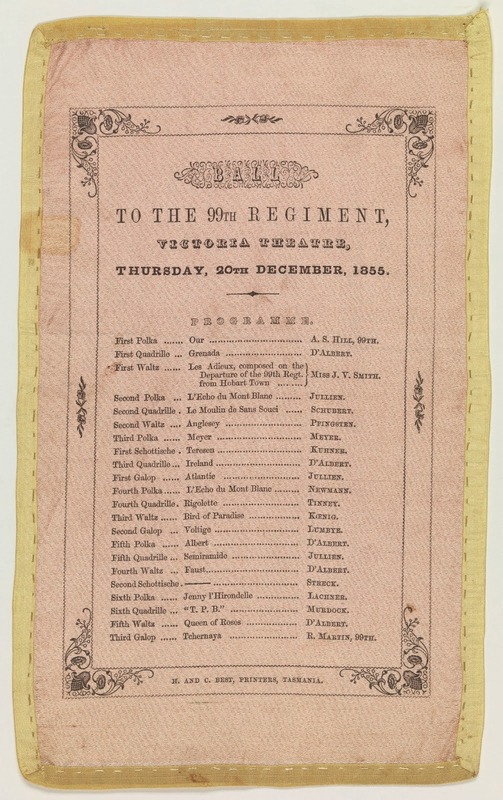 A Grand Ball was held at the Victoria Theatre, Hobart on 20th December 1855 in honour of the service rendered to the colony by the 99th Regiment on the eve of their final departure, attended by Captain Goldsmith among a distinguished group of invitees. The First Waltz on the Programme, “Les Adieux,” was composed by Miss J. V. Smith for the occasion of the “Departure of the 99th Regt. from Hobart Town”. 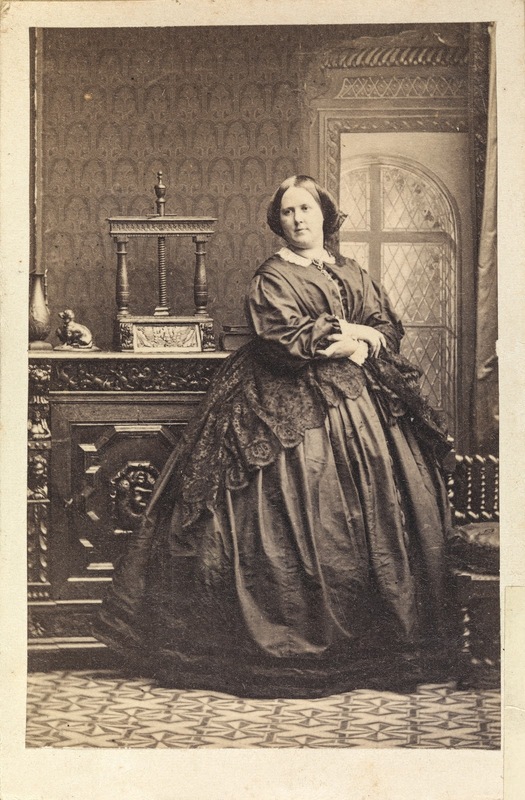 The report in the Mercury of 21st December 1855 of the Ball detailed the lavish set-up of the Ball Room at the Victoria Theatre, including a sly reference to Lady Young’s ample girth in the mention of “a most commodious seat” provided for her at the upper end of the room. GRAND BALL TO THE OFFICERS OF THE 99th REGIMENT. (1855, December 21). The Hobarton Mercury (Tas. : 1854 – 1857), p. 5. This grand affair came off last night, at the Victoria Theatre, which was splendidly fitted up for the occasion. The stage and Pit were boarded over, and carpeted, and under the centre boxes was inscribed in flowers: -“Success to the 99th. : The pillars supporting the boxes were elegantly festooned with the most beautiful flowers, and from the roof of the theatre were suspended the flags of all nations, friendly to the great cause of civilization. On one side of the ball-room, tables were arranged, for a supply of coffee, tea and lemonade for the ladies, and in the saloon a mots sumptuous supper was displayed, under the able supervision of Mr. Webb whose catering on such occasions, needs no eulogium at our hands we may observe; however, that every delicacy of the season, and especially in fruits from the Pine Apple to the Cherry, was abundantly supplied; in fact the tables were covered with good things, in almost endless profusion. It is but right that we should mention tht the arrangement of the floral display was made by Mr and Mrs Watson, and a more graceful display of floral elegance, we never witnessed. The company began to arrive at about nine o’clock, and the vie of the ball-room from the boxes presented a spectacle, which we could only compare to some fairy scene. In fact, all the bright beauty and fashion of Hobart Town were there, including His Excellency and Lady Young for whom a most commodious seat was provided at the upper end of the Ball-room. As is usual on such occasions, the festivities were prolonged to a late, or rather, to an early hour, when the party broke up, highly delighted with their enjoyment. We may add, that His Excellency was received with a Guard of Honor, and on his entrance into the Ball Room, the Band played the National Anthem, the company standing. Amongst the visitors we observed, the following citizens:- The Colonial-Secretary, Messrs Anstey and Clerke, M. L. C. , the Speaker, Messrs, A. B. Jones, John and James Dunn, Pitcairn, W. Robertson, R & N. Lewis, Capt. Goldsmith, Doctors Bedford, Jackson & Brock, Messrs. S. Moses, Hull, J. Roberts, Hall, Bowne, B. O’Niele Wilson, D.C.A.C. Ashton, Mills, Mr D’Arch. Mr. Sorell, Col. Hamilton, Capt. Miller, and many others. The general public, however, felt excluded from such an exclusive gathering which included only the officers of the 99th Regiment. 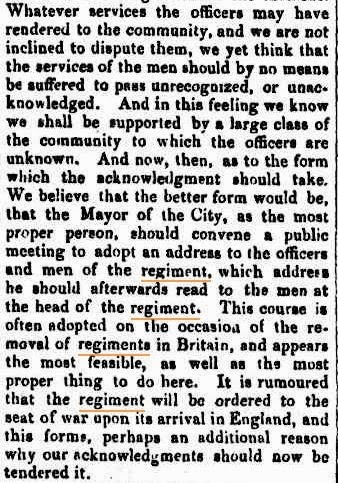 Instead of a Ball, the writer of this article which appeared in the Colonial Times on 11 December 1855 suggested a public meeting should be convened by the Mayor where the service of the rank and file soldier could be acknowledged, especially as it was rumoured, those men were to be deployed to “the seat of war” once back in Britain. Captain Henry James Day (1803-188-? ), first cousin of Thomas Nevin’s father-in-law, master mariner Captain James Day, was Guard Captain of the 3rd detachment of 99th Regiment of Foot on board the convict transport Candahar when it arrived in Hobart in 1842 with 60 troops under his command, and 249 male convicts. Also on board were a “lady and four children”, several soldiers’ families and government stores. The Candahar was a 4 gun barque of 642 tons built in Shields in 1840, class A1 which departed Spithead, England on the 2nd April 1842, docking in Van Diemen’s Land on the 21st July 1842. 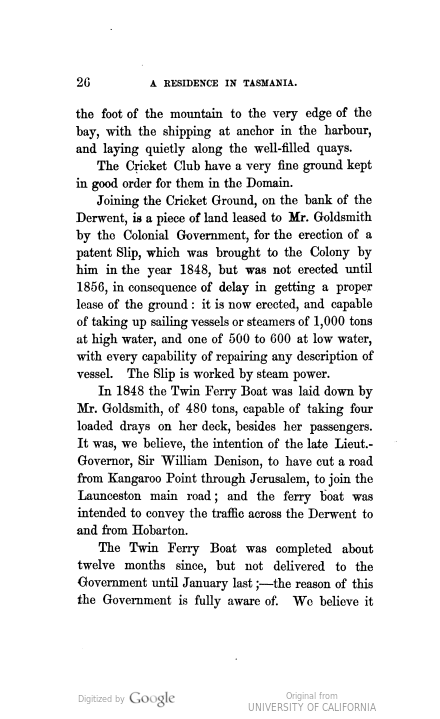 Captain Day’s arrival was noted in the Hobart Town Courier. The regiment was stationed at the Anglesea Barracks, Hobart. On the 10th August 1842 the Candahar departed Hobart Town, Van Diemen’s Land for Sydney, N.S.W, arriving on Tuesday the 16th August 1842 laden with government stores. Captain Day and family proceeded to Maitland. Captain Henry James Day served on Norfolk Island again as guard captain of the Sir Robert Seppings, a convict transport hulk which returned to Hobart on 4th October, 1852. He was now accompanied by Mrs Day and eight children, four more than in 1842 when she arrived on the Candahar. Detachments of the 99th Regiment were sent from Hobart to Norfolk Island and New Zealand. 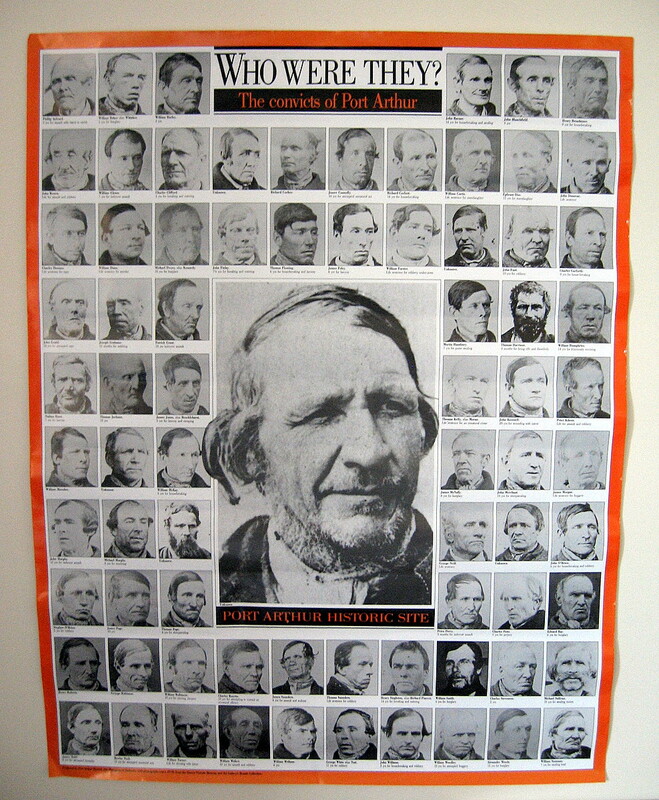 In 1845 members were sent to New Zealand to quell the Maori rebellion. A detachment took part in the assault on Ohaeawai Pah on 1 July 1845 and on Ruapekapeka on 10th January 1846. The campaign lasted for two years. The regiment returned to Hobart, Tasmania in 1847, stationed there until 1854 when a contingent was sent to Victoria. In 1848, Captain Henry James Day was stationed at the Blackheath Stockade, NSW, as assistant engineer and superintendent, but by 1852 he was back in Hobart, VDL. Their stay in Hobart was not without tragedy. 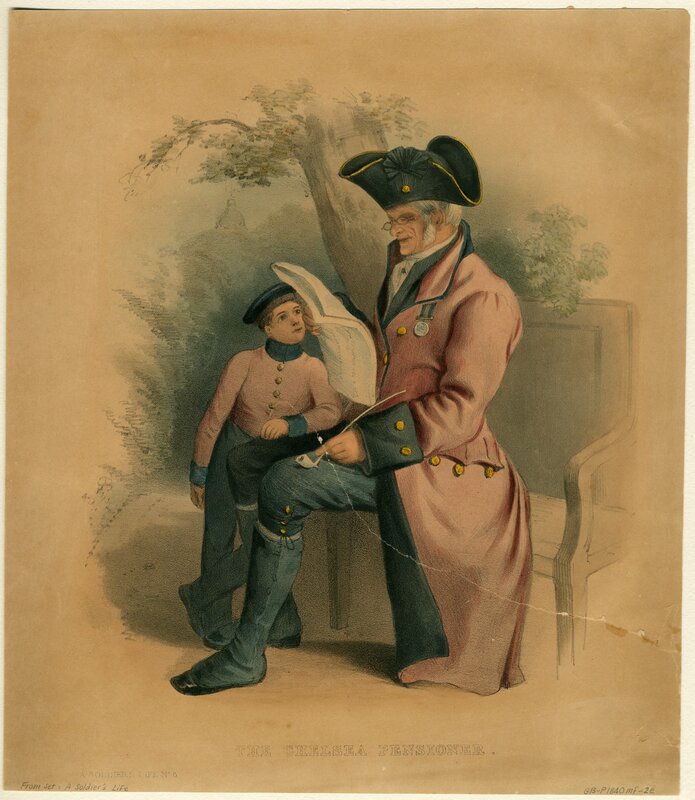 One of Captain and Mrs Day’s sons, George Henry, aged 5yrs, died on 30 August 1853 while stationed at the Anglesea Barracks. Mrs Eliza Day (nee Eliza Terry, daughter of a proctor in the Vice Admiralty), married Henry James Day at Port Louis, Mauritius in 1832. She was 19, he was 28. He was born into the Imperial Forces on Jamaica, christened in 1803, and commissioned in July 1825. Just as they were born to parents into service in the colonies , so were four of their eight children. Mary Jane was born on Mauritius (1833); Henrietta (1844) and George (1848) were born in NSW, and Arthur Frederick Francis was born on Norfolk Island (1850). 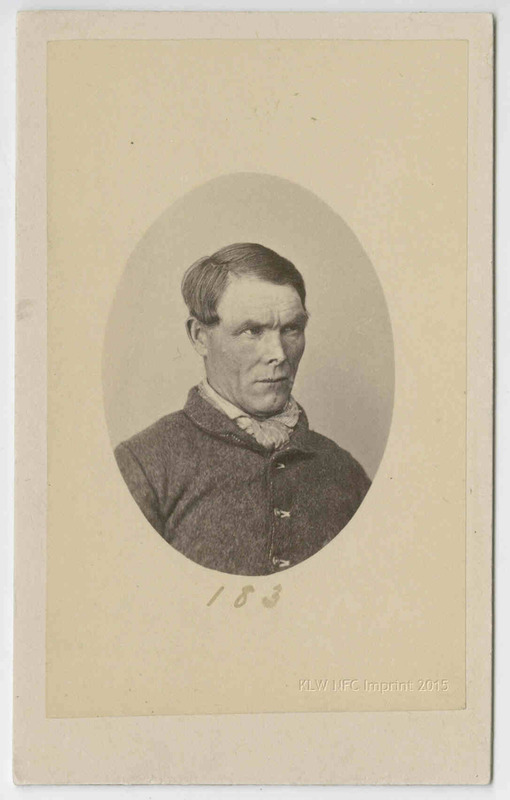 Coincidentally, Thomas Nevin’s father, John Nevin, was attested the same year, in 1825, spending the next 12 years from 1826-1838 in the West Indies before serving at the Canadian Rebellions in 1839. Eight children were listed on Captain Henry James Day’s service record by 1863, including a son with the same name, Henry James Day, born in 1833. When the family returned again from Norfolk Island to Hobart via Port Arthur on the Southern Cross, Commander George McArthur (347 tons, 2 guns, registry at Hobarton) with the 99th Regiment, on 7 Mach 1855, Henry James Day snr was listed as Major Day, accompanied by Mrs Day, five Miss Day’s and a Master Day (i.e. male child). All seven of his children, with the exception of Henry James jnr, the eldest son, were travelling with him. Also on board were 1 sergeant, 4 corporals, 27 privates, 10 women and 25 children of the 99th Regiment. 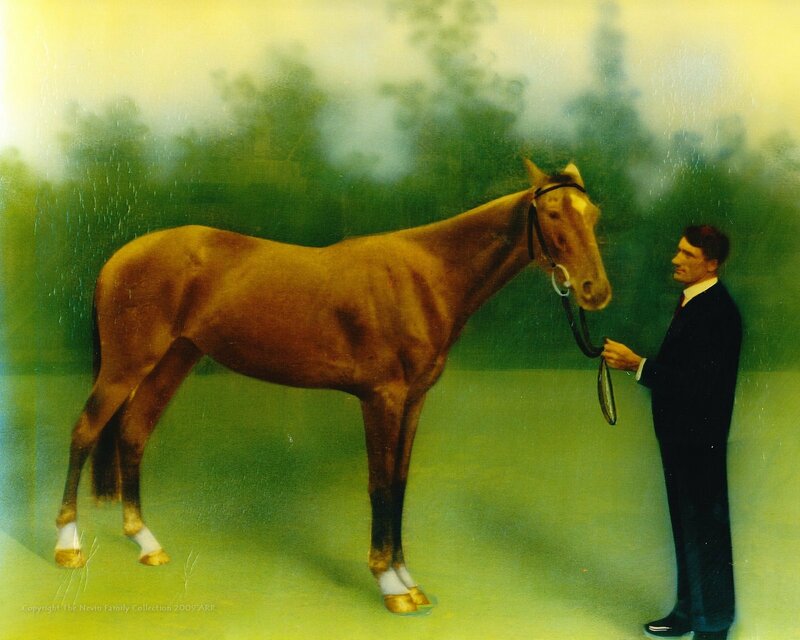 They had landed 2 prisoners, 4 horses, 2 cows and part of cargo at Port Arthur before proceeding to Maitland, NSW. Captain Day served in Australian waters until 1856, proceeded to Bengal 1858-9, and from there he was deployed to the Chinese Rebellions of 1860. 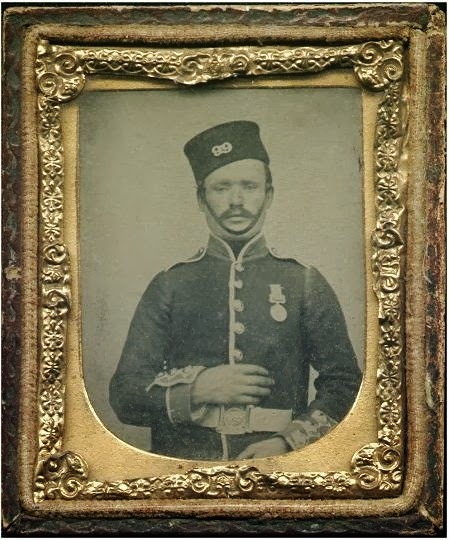 He was awarded the Chinese Clasp of Pekin, and retired from the 99th Regiment as Honorary Colonel brevet in 1863. Archival records of the 99th: Henry James Day’s (senior) record of service and more officers of the 99th Regiment, for example, Loftus John NUNN, who married Jane Anne Pedder at St Davids on 4 Dec1851. Click here – NB this is a large file: The 99th Regiment Records of Officers’ Services pdf. 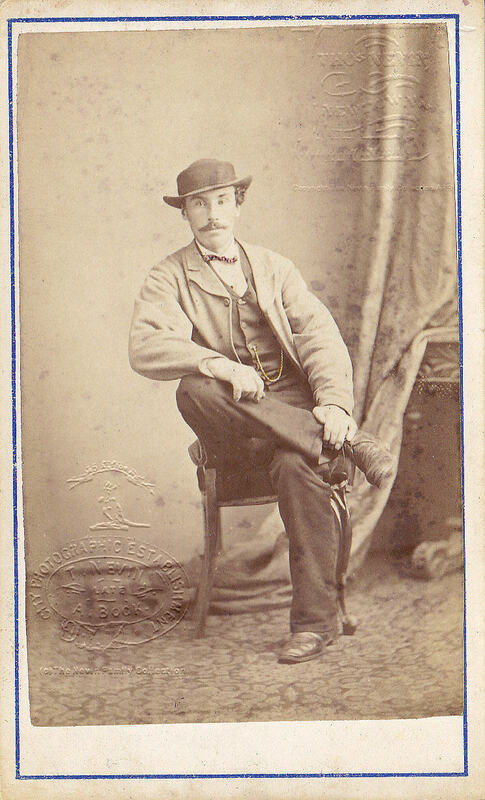 Captain Edward Goldsmith (1804-1869) was the uncle of photographer Thomas J. Nevin’s wife, Elizabeth Rachel Day (1847-1914). 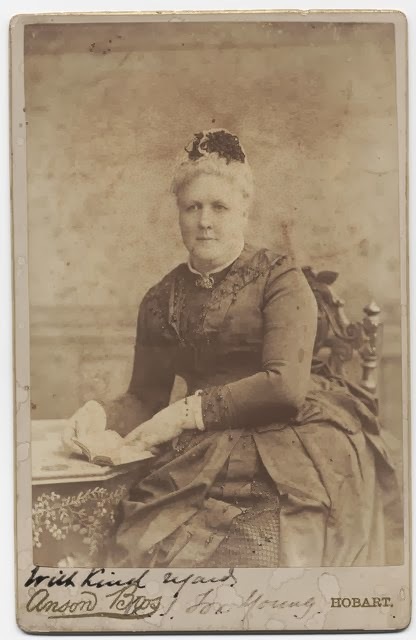 Her aunt and namesake, Elizabeth Day, sister of her father, master mariner Captain James Day, married Edward Goldsmith, master mariner at Liverpool, Yorkshire in 1829. Captain Goldsmith’s illustrious career as Master and Commander of the great merchant ships spanned twenty years and almost without incident from his first documented voyage to VDL in 1831 to the sale of his favorite barque, the Rattler, in 1852, the year Thomas Nevin arrived in Hobart as a ten year old child with parents John Nevin (journalist and former Royal Scots soldier), Mary Nevin (nee Dickson), and siblings Rebecca Jane, Mary Ann and Jack (William John) on board the Fairlie, a convict transport also carrying soldiers of the 99th Regiment. Captain and Elizabeth Goldsmith had two sons: Richard Sydney, born 1830 in Western Australia, baptised in NSW, who died from fever aged 25yrs in Hobart, in 1854; and the second son who was named after his father, Edward Goldsmith jnr, born at Rotherhithe, UK on December 12,1836. He travelled with his parents on several voyages to Hobart from London before attending Trinity and Caius Colleges Cambridge in 1856-7. In 1855, when Edward Goldsmith jnr was 19 years old, he accompanied his father to the Governor’s Levee, an early afternoon reception and ceremony held only for men, at Government House, Hobart. Edward’s cousins, the Day sisters, were still children under 8yrs, and most likely deeply impressed by their older cousin’s account of this fine affair. By 1854, master mariner Captain Edward Goldsmith had enriched the colony of Tasmania for more than twenty years through his annual voyages in command of merchant ships bringing immigrants, agricultural produce, rare plants, ship and engineering equipment, and fashionable merchandise from Europe and the Americas. 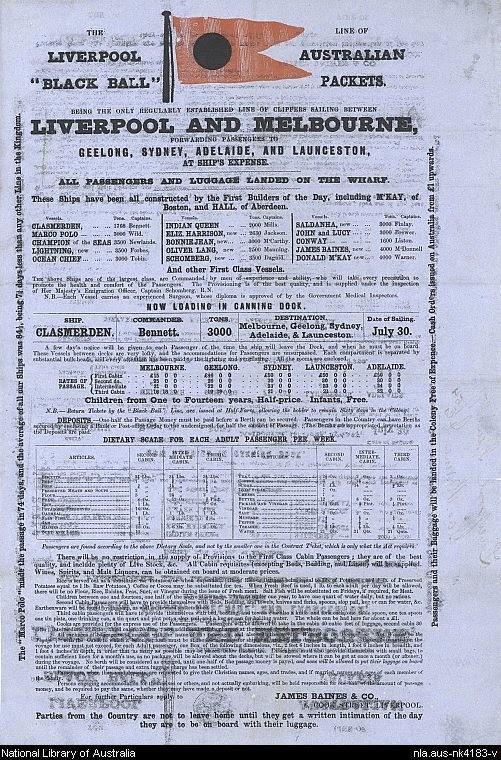 He had benefited the colony through the export of Tasmanian horticulture, wool, and timbers, especially the blue gum which he exhibited at the Paris Expo in 1855. He constructed the first patent slip on the Domain in 1854, and he bought land in the Lake St Clair area of northern Tasmania. 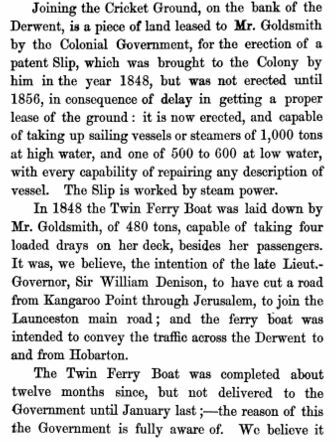 He was a Director of the Hobart Town and Launceston Marine Insurance Company, established in 1836, and notably for Tasmanians, the builder of the twin steam ship Kangaroo in 1854, operating from McGregor’s Patent Slip at the Queen’s Domain Hobart. 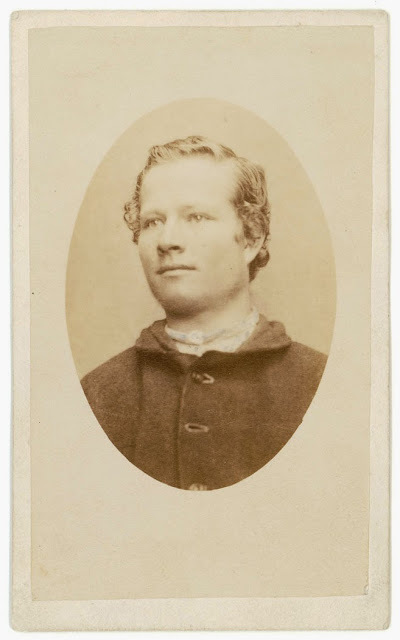 He was a witness at the marriage of Rachel Pocock to his brother-in-law, Captain James Day (also his Navigator and First Mate on the London run dating from the 1830s), parents of Elizabeth Rachel Nevin and Mary Sophia Axup, nee Day, at St David’s Church Hobart on January 6th, 1841. He was present too when his eldest son Richard Sydney Goldsmith died in Hobart in 1854, aged 25yrs. Captain Edward Goldsmith was a close friend and dinner companion of Jane and John Franklin at Government House. He was highly esteemed by both the Hobart City Corporation’s Mayor and aldermen and the business community. He attended the Regattas as a judge, and at his testimonial dinner in 1849 at the Hobart Town Hall, he stated that he might become a colonist and settle in Hobart, but that was not to be. The Royal Society of Van Diemen’s Land elected him a member in 1851. He attended many social functions sponsored by the Governor (Levees) and the Mayor before his final departure in 1856, sometimes with his younger son Edward Goldsmith jnr, . 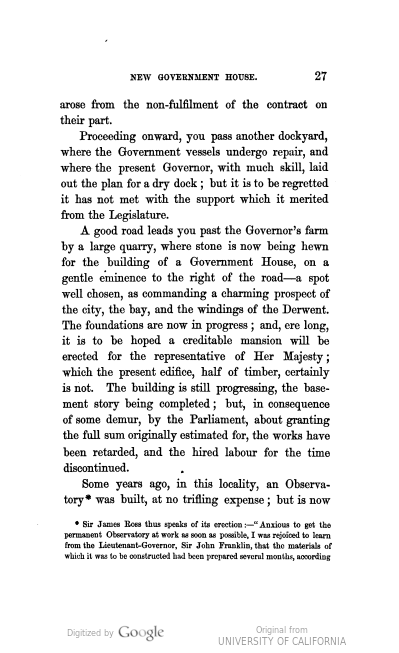 The construction of the New Market on the Hobart Wharves, and the banquet held to celebrate its opening in January 1854, was another of his interests and an event he attended in the company of Hobart’s most illustrious officers and the colony’s most modest traders alike. His final farewell came at the Ball hosted by His Excellency and Lady Young on the eve of departure of the 99th Regiment on 20 December 1855. On February 21, 1856 Captain Edward Goldsmith boarded one of the Black Ball Line clippers, the Indian Queen, in Hobart as a passenger, accompanied by his wife Elizabeth and son Edward Goldsmith jnr, bound for Liverpool, England, on his final voyage from the colony re-named Tasmania just months prior, in July 1855. Passengers Capt. 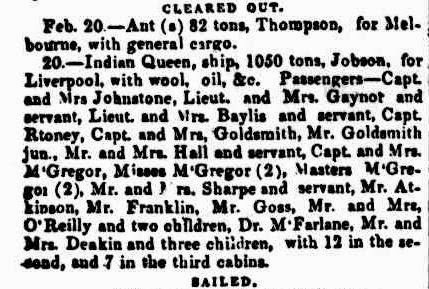 and Mrs Goldsmith, Mr Goldsmith jun, sailed on the Indian Queen, 1050 tons, for Liverpool with wool, oil etc, February 20, 1856. Both the Cornwallis and The Indian Queen were later shipwrecked. 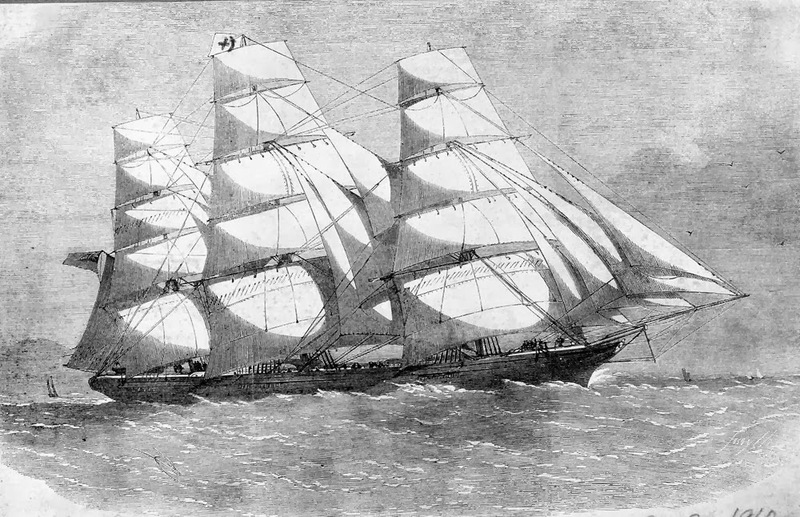 THE IRON CLIPPER-SHIP CORNWALLIS, A NEW VESSEL OF THE BLACK BALL LINE. Wrecked. Published [ca. 1862] print : wood engraving with hand colouring ; 15.0 x 23.0 cm. 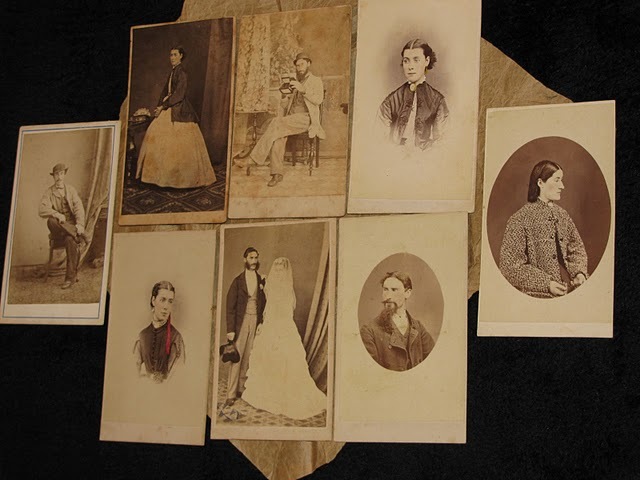 Edward Goldsmith jnr and his cousins, Mary Sophia Day, Thomas Nevin and Elizabeth Nevin nee Day, Mary’s sister, ended up in Chancery over Captain Goldsmith’s will in 1872. These two daughters of Captain James Day and nieces of Captain Goldsmith were to have inherited the eleven cottages, No’s 1-11, at Vicarage Row, Higham, but their cousin, Edward Goldsmith contested this legacy of his father’s will (Ref: National Archives UK C16/781 C546012). More about this extraordinary case in a future article. 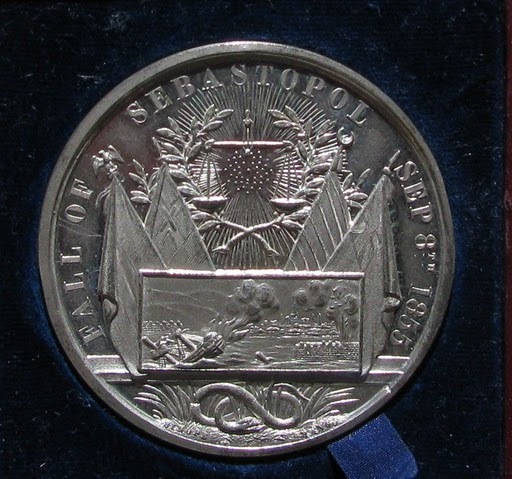 When Thomas James Nevin married Elizabeth Rachel Day in 1871, they were gifted a medallion issued to commemorate the end of the Crimean War: the Fall of Sebastopol 1855 and the ensuing Treaty of Paris 1856. 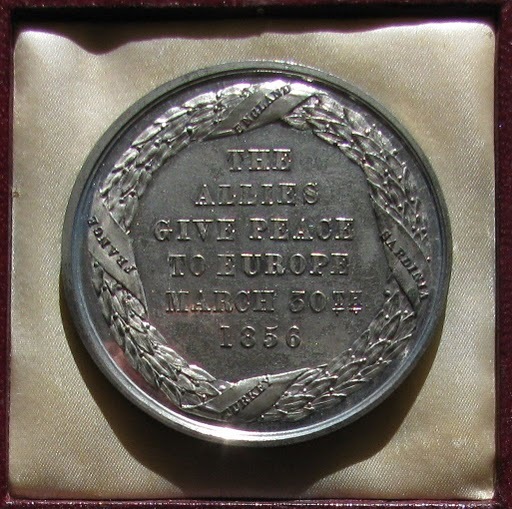 The provenance of the 1856 Treaty of Paris medallion prior to its acquisition by the Nevin family is not known. 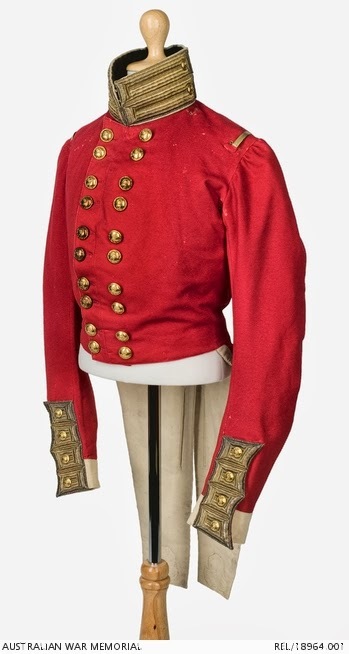 It may have been a gift from Captain Henry James Day of the 99th regiment, as some of the 99th were deployed to the Crimea soon after arrival in Britain. Then again, it may have been sent to Elizabeth Rachel Day by cousin Edward Goldsmith who had served briefly at the Crimea as buglar. Lastly, it may well have been given to the couple by Thomas Nevin’s father John Nevin, former Royal Scots 1st Regiment soldier, whose friend William Grahame and father of Major Grahame had served in The Royal Scots Fusiliers at the Crimean War. Medallion and photos © KLW NFC The Nevin Family Collection 2009 ARR. Video at YouTube of the Crimean Landscape 1856.